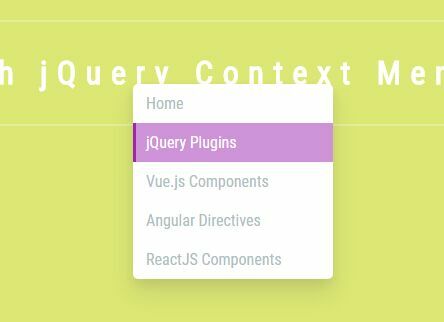 All the Free jQuery Plugins about 'context menu' are listed here. 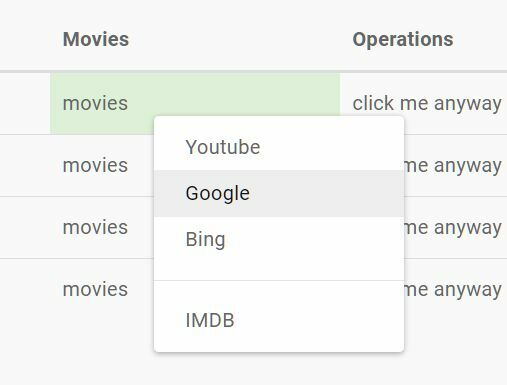 The Super Context Menu plugin enables you to create a dynamic, customizable, multi-level context menu on any container element you specify. 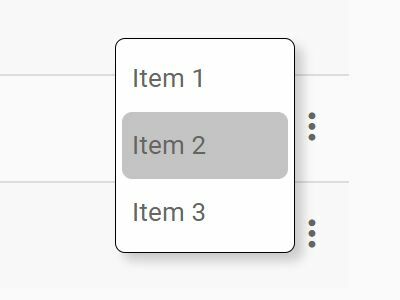 A jQuery UI and jQuery based plugin that displays a clean and animated context menu by right-clicking in an element or using open and close methods. 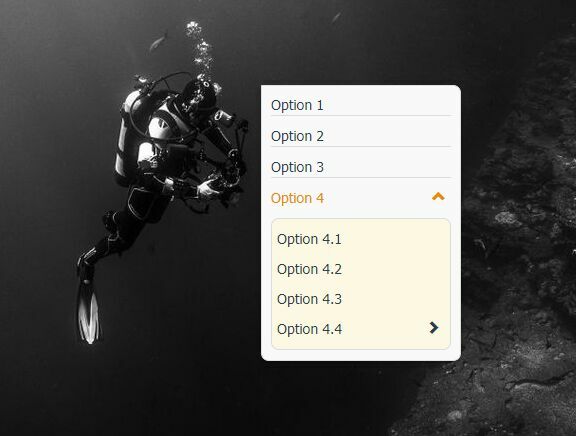 The Popup Menu jQuery plugin lets you create and display an animated, customizable context popup menu when you click or hover on a specific trigger element. This is a lightweight jQuery snippet to create an easy-to-style context menu instead of the browser's default right click menu. A really simple jQuery context menu plugin which helps you display a custom context menu when right click on an element you specify. The jquery-menu.js jQuery plugin makes it easier to create a customizable, multi-level context menu from nested html unordered lists. The jQuery contextMenu plugin that allows you to bind a dynamic right-click context menu with custom actions to any DOM elements. A lightweight, convenient jQuery context menu plugin which shows a dynamic, multi-level menu when you right click on a specific container. 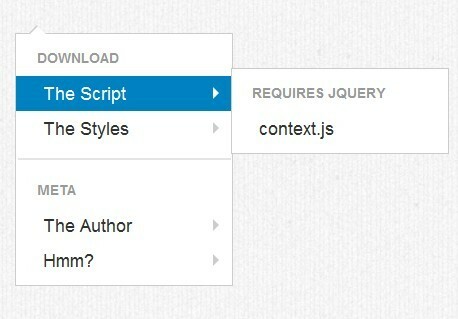 A jQuery context menu plugin for Bootstrap that enables you to attach a custom context menu to any DOM element, with support for custom actions and various trigger events. GalMenu.js jQuery plugin to replace the native browser context menu with an animated circular popup menu where the items are wrapped around a circle. Contextify is a jQuery plugin that enables a simple right click context menu within a given container using Bootstrap dropdowns component. Bootstrap Context Menu is a lightweight jQuery plugin which binds a Bootstrap styled context menu to right click on any container. Compatible with Bootstrap 4/3/2. 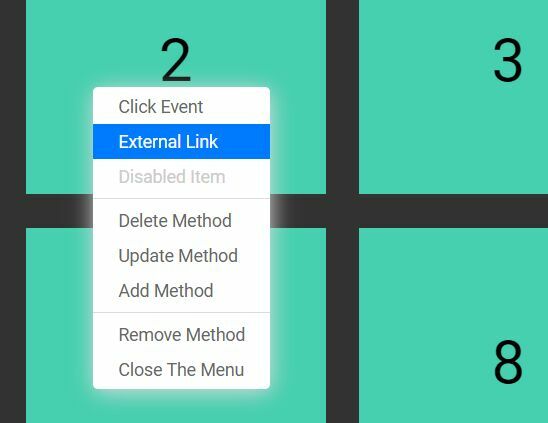 rClick.js is a very small jQuery plugin that creates a custom menu to replace the default browser context menu when you right click on the screen. 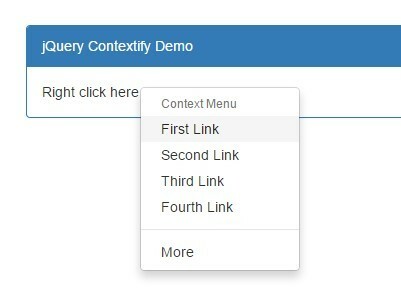 Our Context Menu is a jQuery plugin which helps you bind a customizable and themeable context menu to the right click event within a specific container. Audero Context Menu is a lightweight and cross-browsers jQuery plugin for creating custom context menus on right click or left click. 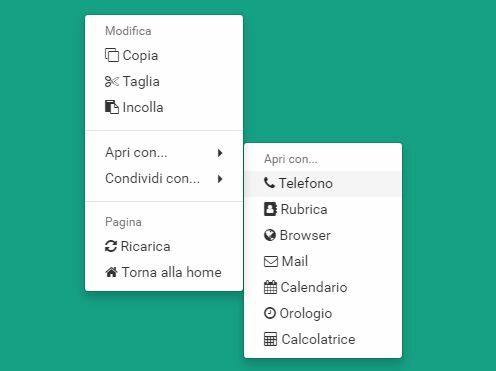 nuContextMenu is a lightweight (~3kb) jQuery plugin used to generate a fully configurable context menu within a given container that is triggered by right click. 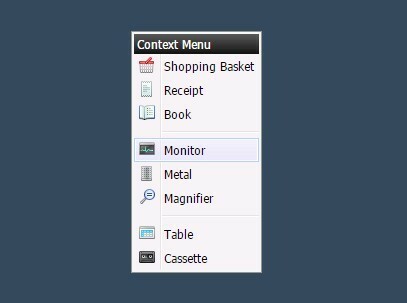 Context.js is a flexible, Bootstrap-compatible jQuery context menu plugin that features infinite depth, dynamic menu creation / deletion and smart space detection. jContextMenu is a jQuery plugin which allows you to create a custom multi-level context menu as you right click inside a certain container. An extremely lightweight jQuery plugin that uses Bootstrap Dropdowns component to apply a right-click context menu to specified container. A lightweight jQuery context menu plugin that displays a Windows like popup menu with icons as you right click on a given container. A mimalistic jQuery script that creates a fully customisable context menu to replace the default right-click menu on your web page. 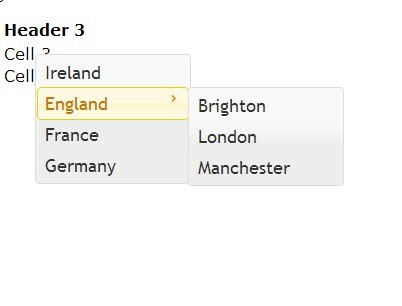 A tiny jQuery plugin which allows you to create a right click context menu using native Bootstrap's dropdowns component. 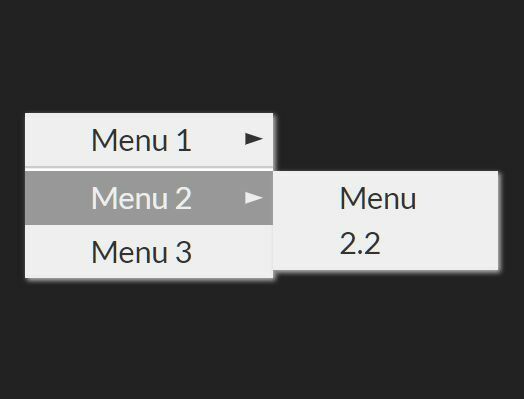 CustomMenu is a simple jQuery plugin that uses jQuery UI menu component to create a right-click context menu within any html element. 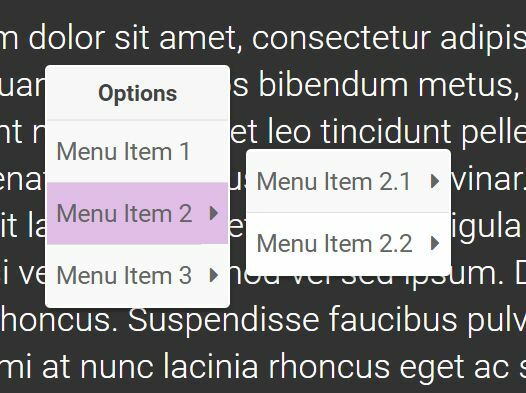 jqCtxMenu is a lightweight jQuery plugin used to create a flexible multi-level right click context menu within any Html containers. 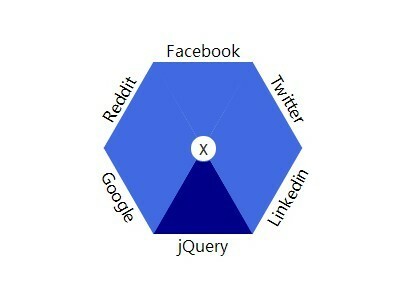 Radial Menu is a fancy jQuery menu plugin that uses CSS3 transforms to create a customizable Radial/Hexagon menu which can be used as a context menu for your web page. 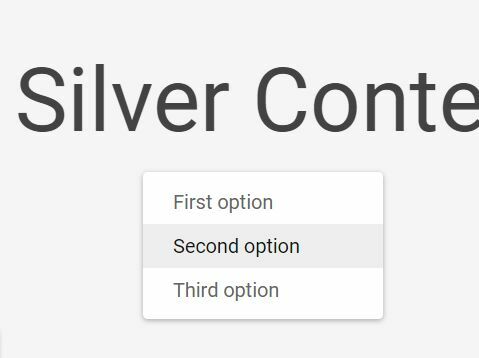 Just another jQuery plugin for creating a customizable multi-level right-click (or left click) context menu that features auto resize, keyboard control, infinite amount of sub-menus and much more. Contextmenu is a simple, cross-browser jQuery plugin that creates a right-click context menu appending to any html elements, with callback support. A minimal and fast jQuery plugin that allows you to create a styleable right click popup menu (context menu) within a DOM element. 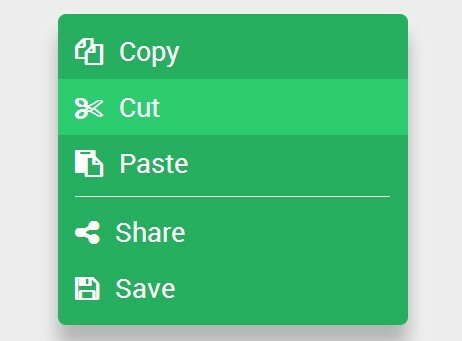 Chrome Context is a lightweight (~1kb minified) jQuery plugin for creating google chrome browser style context menus when right clicking html elements. Singleton Contextmenu is yet another jQuery context menu plugin that allows you to create a right-click menu with custom callback on clicking.